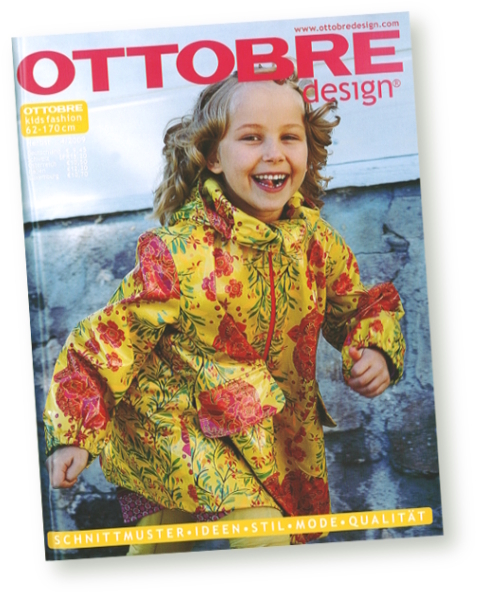 I was so excited to see my oilcloth on the Autumn cover of Ottobre magazine, but altogether bummed as well that this oilcloth has sold out from every point on the planet. I have answered SO many individual emails regarding the oilcloths and their availability but haven't had a chance to come clean here. So the story started with me showing off the new oilcloths, and promising more, which apparently had such a lovely result that they became unavailable before many stores even received their shipments. Unfortunately the production time on reprinting those and new pieces was so far out, that Westminster chose not to reorder. We could call this the bad news. There are two new oilcloths in the works as part of my NEW (thats right, you heard me) collection of fabrics hopefully to be shipping in Septmeber or October. So the fabulous rain slicker pattern included in this issue of Ottobre need not go to waste, but will have the chance to be sewn up in some seriously sweet, slick, little prints. Can't wait to show you! I have two extra copies of the Autumn issue sitting here on my much too cluttered desk, and well, just thought two someones out there may want to put them to use, and help me declutter. Leave a comment and I'll draw two names sometime next week and send them on their way. Awe, you're welcome. Ack, that bird is smart and just looks like it's squawking away. Oh, and speaking of squawking, Daria caught me doing such and posted a video interview with me from last fall Quilt market (where I give away a little more about the next fabric line and also lie about it's debut date, which I have become so good at). So you can check that out if you have something more important to do but are procrastinating. I like to be helpful where I can. oooh...I would love to take the magazine off your hands. I never win anything! Maybe this will be my lucky day! I too would love to help you declutter. I just adore that raincoat! Can't wait to see your new oilcloths. I love that Magazine. Have bought a few copies and made beautiful clothing for my grand kids. I have also used your fantastic fabric in my quilts. That's just about the cutest rain slicker ever! Love it! And I'm bummed about the oilcloth, too. I was so hoping that I'd be able to find some oilcloth to re-upholster my dining room chairs with. Having kids...I need a wipe-able surface!! Thank you for the opportunity, I would love a copy of the magazine! Of course I don't know you, but i feel like i do. I admire your talents and ability to keep up this blog with all that you do. i havent had a new issue of ottobre in almost a year! id LOVE one. love the use of the oilcloth for the slicker...however having four little boys don't think they would appreciate the flowery frills! LOVE the outfit they sent for Roman - love a little inspiration! ps hope he's still sleeping through the night - mine always love to tease me! that is the cutest little pair of pants! Very excited to hear there will be new oilcloth !!!! Thanks for the giveaway with the magazine! Would love to help you out with that!! Can't wait to see your next line! Not sure if I can bear the excitement of it, though! Working on a quilt from a quilt along at Old Red Barn using your Garden Party line and a couple prints from Good Folks. You can see some of it at my blog, www.lovehazelsews.blogspot.com. Love the outfit for Roman. Thanks for sharing him with us. He is precious. I would love to get my hands on one of those magazines! I have heard so much about them but never seen one. The outfit they sent for Roman is darling! Thanks for helping with my procrastination! I'd love to be in on the cance to get a look at Ottobre. I'm thinking of getting a subscription. I just bought Seams to Me and love it!! I've been wanting to check out that mag...I'd love to help you get it off your hands. A new line...I can hardly wait! oh, Oh, OH! Add me in the round up. What great summer reading ... can't wait to see what you have dreamed up this time! Wahoo! Loves me a giveaway. Especially one that involves a rain slicker pattern (we just moved from the desert of AZ to Portland, OR) from Ottobre, of all places. Been meaning to order a subscription for quite some time now! Fantastic magazine cover with that darling rain slicker! That is THE sweetest little baby outfit. Can't wait to see your new fabric collection. I love the oil cloth, it's beautiful! 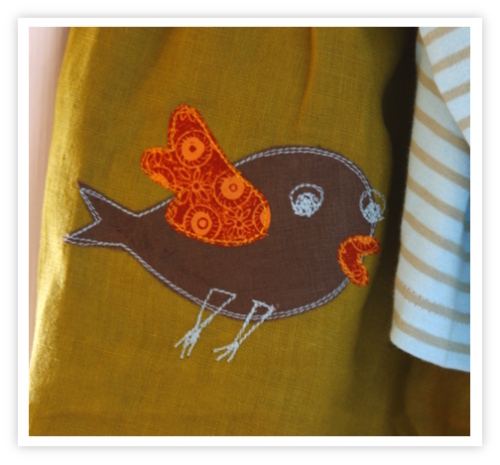 But the little birdie applique steals my heart! I love Ottobre! Almost as much as I love your fabric designs. I can't wait to see the new fabric line...and of course I would be happy to help you de-clutter! i have heard so many nice things about that magazine but have yet to see one, maybe, maybe, the oilcloth is cute, not sure what i would make with it, but i love your bag you made with it. Oooh! I'd love to help you declutter! I also can't wait to see the new line!! Ottobre has so many cute things for kids, I would love to get a copy. yes, please. can't wait for little folks. i am currently making an aprons that incorporates "good folks." Ugh, I knew I should have bought it when I had it in my hand!! But new prints is good too. Sending a copy of that magazine all the way to Australia would be a true act of international craftitude. I'd be happy to help out. I almost ordered two plain raincoats today from an outdoors retailer, but I'm glad I saw this post and was reminded of your gorgeous oilcloths. Oh, the Ottobres catalog looks like so much fun. And the little bird for Roman is darling. I have never seen the mag before, but I think I could get a lot of use out of it. I made a lunchbag with oil cloth and it turned out very cute. Your new oilcloth will surely be adorable so I am looking forward to get some and create the slicker from the Ottober magazine! Can I have one of your 2 extra copies...Please? Wow that would be great, my husband is thinking of geting me a subscription for my birthday but I want to make sure I will like it first. But I'd love to have a picture of it on the cover of one of those magazines! Okay, time to listen to that interview now. I love Ottobre! I still haven't tackled a pattern, but I just love drooling over the pictures :). I can't wait to see the new fabric collection - especially the oil cloth! Thanks for sharing your magazines! Oh, and I'd LOVE that new Ottobre issue, I'll keep my fingers crossed! I'm so looking forward to your new line of fabric! And I would adore the magazine. I have twin boys (to be 2 next week) and a four year old daughter, so I would definately have fun sewing up some cute new fall clothes for them! That outfit is adorable! Can't wait to see your new collection. So fun! It looks like an awesome magazine and how sweet that they sent such an adorable outfit for your darling boy. I'm always looking for fun new mags to read, especially from out of the country! That raincoat is to die for! I can't wait to see the new prints - Sept/Oct is not too far off. Loving that cutie patootie baby outfit and would love to get a copy of that magazine. Can't wait to see your new line of fabric - when do you find the time? Congratulations! I have been wanting to check that magazine out for a while! Those pants are so cute. Wow, congratulations on so many levels. I'd love to check out the magazine - thanks! I love Ottobre! The little bird outfit is so cute! I'd love to help you declutter! I have read many good things about the magazine. Oh I love the oilcloth. I want some for sure!!! Thanks for the oppurtunity. I would be happy to help you de-clutter. Anytime. Just call and I'll be right over haha. Sigh. How cute is that little outfit? It is simply adorable. Going over to watch your video interview now... ciao! What an adorable outfit they made for your little man! The jacket on the cover of the mag is beautiful, too! Looking forward to seeing what's new! Hope you have a beautiful weekend! I guess you could say you gave us bad news, but really, I'm too excited anticipating your NEW fabric! Who doesn't need more fabric to stare at and drool on? I have been dying to get my hands on Ottobre for ages, yet haven't gotten myself a subscription! Lame, I know. How sweet of them to send you such a darling outfit for your little darling! I adore that birdy! Oh, and I love your blog! I'm so excited to hear that there will be new oilcloth! Would love to help you declutter. I also wanted you to know that I love your style. 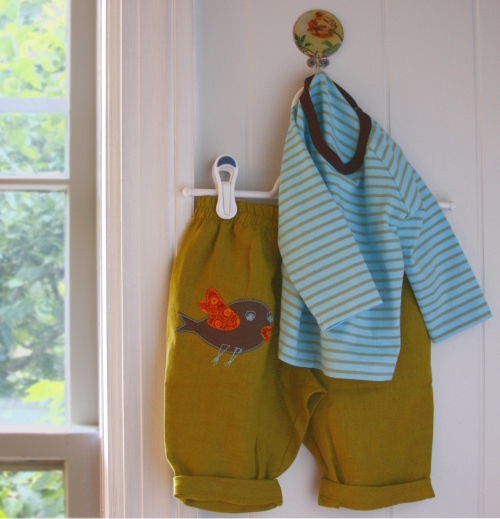 OK, the little birdie pants made me squeal! So incredibly sweet! Looking forward to seeing Little Folks and the new oilcloth. Good things always go fast, really fast in this case. Please throw me into the pot. thanks. Would love to have one of those copies. Always like to see the new things you are talking about on your blog. I have looked all over for cute oilcloth and so glad to know that more is coming! I'm very happy that your original oilcloth sold out so quickly because that means they realize the consumers LOVE it! I would be glad to take one off your hands. Love the raincoat, especially the collar. Ottobre looks like a cool magazine. lol "keep me from fainting cute"
I have a new daughter. You inspire me to "keep on crafting!" I saw that rain slicker & am stunned speechless about how absolutely beautiful it is! Oh my! I LOVE the hand-made baby boy outfit....so sweet. And OH! Do I really really really hope I win your giveaway! What a cute outfit they made for Roman! He'll look grand in it. I can't believe Westminster won't reprint the current oilcloths again. It'd be additional profit! I read your blog faithfully, Anna Maria. Congratulations for Roman! That rain coat is soo cute! And what a super cute ensemble they sent you and so thoughtful! Happy to hear there are more oilcloth's designs in the works because cute patterned oilcloth is a really really really good thing! I keep seeing people refer to this magazine and am dying to get my hands on a copy. Would love to "help" you de-clutter!! I love the bird, how precious! I am bummed they aren't printing more of your oil cloth. I guess I'll just have to buy a lot when your new line comes out. I would love to win that magazine! I also love seeing the pics of your beautiful family, especially your new little guy! And your fabrics are so lovely! well, if it is cluttering up your desk, I would be happy to take it for you. oh please, please pick me :) I want it sooo bad!! Gorgeous oilcloth, gorgeous gift from Ottobre! I'll happily take a copy of the magazine from you if it'll help clear some space on your desk for new designs and fabrics! I'm in the UK so will even help towards postage if you'd like (because I know that can be a pain!). Either-way, thank you for the ongoing inspiration. I don't think you even know how amazing that is. Fantastic! Too bad about your oilcloth selling out so quickly, but I'm sure the pattern would work nicely with different oilcloth prints. Looking forward to seeing your new prints when they come out! swoon! And hooray for new oilcloths...I decided I was much in need of them only to find others much in need had beaten me to it all! Hooray for a chance to get my grubby mitts on some after all! I just love Ottobre! The little birdie is adorable. I can't wait for your new oilcloth. I have always wanted to make a raincoat for my little niece. This would be a great pattern! I've been looking at Ottobre magazine for a while and would love the chance to see it before I subscribe. Let me help you de-clutter! The oilcloth looks so cute as a little rain jacket. Looking forward to your new fabric line! Anytime you need help decluttering anything, I'm there for ya! he he! A sweet jacket like that is just what my girl needs in the seattle rain! I am so excited to hear about the oilcloth. Those pants are too cute! i think i am one of the many looking for the oilcloth as well. bummer for the loss ot it...and yippee for the new stuff ahead. there are always good things to look forward to, e just have to wait for them. love the little outfit for your little man too. so cute, lucky duck...or should i say, birdie!! New fabric! Oh Anna you've made my weekend! I can't wait to see it and the new oilcloths! I can't wait to see the new fabric and I would so love to take that magazine off your hands. Hopefully it will inspire some serious inspiration! I love the fabric on the cover of the mag! Pick me ! Pick me! What an adorable little outfit for an adorable little guy! I would enjoy perusing that magazine! I would love a copy of that magazine, and I'm REALLY glad that I have some of that oilcloth stashed away--and can't wait to see what is new on the horizon! oh I would love to help you declutter! Wow! Can't wait to see the new stuff! Thanks for such an awesome giveaway! Sweet. I love the little boy looks in Ottobre. Little Roman will look even sweeter in his Cute Bird Outfit! The magazine would make a wonderful addition to my collection. Love the cute little boy outfit. Have never seen Ottobre and would love to win it. Thanks, Anna!! I had just been thinking of ordering the issue. It's still July, but I'm totally in love with the idea of fall clothes! Those pants are too much! I love them. I love Ottobre. Sign me up! I love sewing for my 2 (soon to be 4!) grandchilren. I would love the Ottobre fall issue. Thanks for having the drawing! Excited for the new line!! Just made my day!!! A new collection coming.. New materials for the Fall Sewing and Quilt Making!! Please include me in the Declutter..would be just great to have!! Roman is so precious and the little outfit if just a knockout!!! who wouldn't like a cool magazine! that bird on those pants is too too cute! OOOHHH Thank you!! And the bird is adorable!! Adorable. Absolutely adorable! I grew up in the RAINY state of Washington and my fiance and I may be leaving our current location (hot, desert, las vegas) to relocate northward...Oregon maybe? So....the oilcloth raincoat is a MUST CREATE on my list (even if it is a while before we move). Have a great weekend! I love your designs! You are so incredibly talented! Thanks for sharing your words and ideas...and stuff! I'd be lucky to win. I want to make some oilcloth aprons for little boy's preschool classroom, but haven't jumped into it yet. Can't wait to see your new ones. You and your family are so darling. Made my day to hear that you have a new collection coming. You fabrics are my absolute favorite! Thanks for sharing with us! How thoughtful of them - it is too cute! And wow - glad I have some of your oilcloth in my stash - didn't realize it was so hard to find now! Can't WAIT to see the new collection!! I would love to have a copy of that magazine, I've never had a chance to see it before. I bet Roman will be the cutest one in his new outfit! Oh, I've been dreaming of that magazine and looking at line drawings online for weeks! I've been eyeing the Ottober website but haven't been able to get my hands on a copy yet. Those pants are seriously cute! They make me giggle. What a great cover! The rain coat looks great in your oil cloth. Thanks for the great giveaway. Great cover!! I would love a copy. Thanks. Love Magazines and that one would be prefect with the rest. Looks like I'm commenting right after another Bethany. Sweet. I noticed that mariemadelinestudio.net still has some of your oilcloth in stock. Just thought others want might to know. I'd love to have a copy of the magazine. I love your oilcloth, that rain slicker and I and just crazy about you...I am one of your silent readers and it is time I come out...I think you are so talented and I love reading about all your new adventures with your family and career. Thanks for sharing it with the rest of us! I am one of the lucky ones who was able to get her hands on that very oilcloth when it first came out. People, it will be worth the wait to get the next lot. I have purchased several designers' oilcloths over the past few years (but I am too classy a gal to name names) and AMH's is by far the lovliest to work with - soft, supple, fabulous flexibility and of course - the colors! I am really looking forward to seeing the new designs - and the pattern would be awesome so I can stop wearing the gorgeous table cloth I made - ha! Anna Maria - how do you do it - seriously the mind boggles: such a great happy brood and fabulous designs, amazing and inspiring! Awesome giveaway! I've always wanted to take a look at Ottobre magazine, but haven't been able to find it locally! I love the little outfit they sent! Adorable!!! Thanks for the chance! And congratulations on the cover!!! Too cool! I certainly wouldn't mind one of your extra copies of Ottobre, and I would love a little bird of my own on a skirt for my sweet 17-month-old, Cora. Darling. I'm looking forward to your new line. Hee hee, I guess I got the SCOOP on the new fabric line before anybody! :) You're awesome, and don't worry about the procrastination - you had a beautiful baby boy around that time. Excited to see all you are working on. love the oilcloth slicker and can't wait to see more! so glad your colors are all over the world. Can't wait for the new oilcloth and I would love to win a copy of the magazine. The slicker is soooo cute! So sad about the oilcloth but so excited for things to come! ;) The little outfit is way to cute!!! I would love a copy of the magazine. That is the cutest outfit! So cute, if I don't win I'll have to find this magazine somewhere! It would be an honor and privilege to take that magazine off your hands! Can't wait for the new line! I have a little teeny bit of that exact oilcloth print leftover...perhaps a dolly rain slicker...can't wait for the next prints! Love me some Ottobre! That outfit is too too cute. Roman needs to model it for us! I feel blessed that I have 4 yards of your yummy oilcloth in my little hands so I hope to try out the raincoat pattern for Fall! Such a lovely Oilcloth! That slicker is just divine! Oh well I will certainly be on the watch for the new Oilcloth later in the year. Thanks for the opportunity in this great giveaway!! just dying to give ottobre a try! Well, I know the odds are against me here but I'll post a comment anyways: I sure would love that copy of the latest Ottobre. And I can't wait to see your new line, especially the oilcloths! thanks for the chance at the magazine!! I would love that magazine! That raincoat is precious! Cannot wait for the new oilcloth to be available! Roman is such a little man now! I was going to order this from Pink Chalk, but they were already gone.... Thanks for the chance! Oooh oohh me! I want a copy!! I would love a copy of the magazine! Please add me to the drawing-- thanks!!! Declutter...did I hear declutter? :-) I'd be more than delighted to help you transfer a copy off your desk and into my hands! Thanks for the chance to win. If I do get selected, it will be hard to wait until Sept to get the oilcloth! Oh my. Your designs are just so lovely. I would LOVE to have a magazine for myself! I love love love your fabrics! oh.my.goodness that bird is absolutely precious! I have been dying to get my hands on that oilcloth. And I love Ottobre! Ack! NO MORE OILCLOTH in that pretty yellow print?! !!NOT.FAIR!! That outfit is tooooo stinkin cute. I'd love to see a copy of that Ottobre magazine.....looks luscious! I like the oilcloth and would love to receive the extra issue! Thanks! How cute is that outfit for Roman! I'd love a copy of Ottobre. I've been toying around with getting a subscription, but still haven't. Can't wait for your new collection either! It's definitely going in my shop! I have never read this magazine but often see it referenced in sewing blogs. I would love to win a copy! What a fabulous little outfit! I was just thinking I should order an issue of Ottobre... I LOVE their stuff! How do you have the time? I am glad you have the blessings. Congratz on the appearance on Ottobre. It is a truely creative read as well as photos as proven by the one of the raincoat. I would love an extra copy of that mag. A friend of mine served a mission in Finland and could actually help translate it all for me! OMG 176 comments. I've got buckleys, but count me in anyway. I want one!!!! Looks great. Sorry to hear about the oilcloth. I love that stuff. That little outfit is so cute - I love the little bird! I'm sure it will look adorable on your little guy. Thanks for the opportunity to win the magazine - their patterns are so fun. I'd enjoy making something for my niece to grow into! Love your patterns and the fabrics! That outfit is so darling, it makes me feel broody. :o) Please, count me in for the giveaway! I've never actually had an Ottobre magazine in my hands, but I've heard good things about it. And congratulations on your upcoming new line! Today is my birthday and boy oh boy do I hope to be one of those two "someones". Love, love the rain slicker pattern. I too have never had an Ottobre but have heard and seen such amazing stuff about it! I love sewing for my little cousins and would love to make some of the stuff I have seen. I wish they sold it locally. Happy to help you declutter - and love that outfit! We have this oilcloth print available at the store I work at,you can visit the website at www.quiltique.com. If it is not listed on there for sale just give us a call! I will have to get some and make one myself, very cute! Ooh, fun! That is a simply beautiful coat, and the sweetest little bird! I'd *love* to own an issue of Ottobre. I've never had the opportunity to check it out. I have never seen an issue of Ottobre except for references on the internet. Would love to have a copy. Also, I love those pants with the sweet little bird. What a cool idea for knee patches. I have just found your blog several months after buying your fabric for the first time (Good Folks). I am in love! You are so inspirational! I'm using Drawing Room Fabrics to redecorate one of my rooms right now, but I'd love to take a break and check out my first copy of Ottobre. Thank you for the giveaway chance! I take the bar exam next week and would looove to unwind the next week by crafting some project ideas out of that beautiful magazine! Your work and your life are an absolute inspiration to me. Thank you for your willingness to share. despite the insurmountable odds of me winning, I would love love love to help you declutter and take one of those issues off your hands. i've many times wished i had the guts to subscribe. I would love to check out a copy of Ottobre. I have so many great things about it! Thank you! I'd love a copy of the magazine. Thanks for all of your wonderful inspiration! Lucky you, to be on the cover!! The slicker is adorable, and it is a shame that the oilcloth is sold out. Can't wait to see your new stuff though! I've been eyeing that issue for a while. Looking forward to seeing the new oilcloth.